There are many things in the world which are legally permissible but socially unacceptable. When people exercise the full range of choices the law permits them, that doesn't include the right to be welcomed into every social avenue. Choices come with consequences. I never said I supported it, I just stated it was a choice and a branch of this hobby. Just like violent racist yobs are a branch of football supporters. You may not like it but don’t try to deny it’s there. Many think character assassination isn’t socially acceptable but it happens regularly on this forum, often initiated by the same few members. It seems that a few of the so called ‘Grand Masters’ want to try and belittle us Apprentices. Well, I’m a Sixty Five year old Apprentice. Just because i’m new to this forum. Doesn’t mean i’m New to Forums or watch buying. Many of the people actually do most of the work themselves by shooting their own foot (feet) and/or being supportive of things that are not popular or generally accepted by the majority of members. I do not see any denial that they exist, rather that their presence is damaging to the genuine industry and consumers? Where is the evidence that I support fakes. If it offends you so much, why are you linking to a replica forum? I am not trying to speak on his behalf but I think what HM means ( if I may state in less elegant terms ) is supporting or condoning the act of buying a fake. Both should be discouraged. It doesn't matter if it is a part of the hobby. Last edited by Watchfun1; 9th February 2019 at 14:51. I never suggested you did and I am not sure why you are being so defensive? If you look at the link, the first poster is somebody who has posted on this thread - I see that as them (not you) having an unhealthy interest in fakes. Violent yobs are not a branch of football supporters, they are violent yobs who use the medium of football in order to get their kicks as violent yobs. Similarly, fake watch fans are not a part of our hobby, they get their kicks out of faking and just happen to use the medium of watches to get their faking kicks! See Chris you’ve just done it again by adding ‘and I’m not sure why you are being so defensive?’ on the end of your first sentence - you can’t help yourself! It’s the insinuation and innuendo that I have a problem with. You linked to another member who’s ‘crime’ was to post on a replica forum. I’ve read his posts and most seem to question the point of the whole thing once you get of the initial potential ‘buzz’ of potentially getting a ‘Rolex’ for £300. The irony of the rep game is it likely to be more expensive long term than just buying the real thing. I was a genuine observation - if you take it as a veiled criticism then so be it. The celebration of and trade in fakes. Nonsense, you are however a purveyor of fear to drive business your way. I’ll stick to getting watches verified by the manufacturer, thanks. Would you care to define “the rep game” yourself, then? As for your attempts to nibble and deflect, the U.K. jewellery trade, police forces, asset recovery teams and insurers all seem to attribute significant weight to my position on fakes and high value watch crime. In how many active cases are you involved? Last edited by Haywood_Milton; 9th February 2019 at 15:43. It would appear that the brand has become difficult to invest in, if these super fakes are of better quality than the brand manufacturers own products and even AD's cannot distinguish the real thing from a fake in the flesh then what steps should be taken to ensure that one does not end up holding a kipper? Can’t believe you are so disrespectful of other people’s views. Again you’ve picked on a small nuance of language to imply I support this activity - that’s what I’ve got a problem with. This is a topic to be debated sensibly and shouting down anyone who doesn’t immediately align perfectly with your view of the world is not helpful in educating us all. Regarding the other comment I made, it was unnecessary and I apologise. Smashing, but how do you define “the rep game,” if you consider my definition to be nonsense? Haywood you are just being obtuse now, having editing your post several times. As I said your statement insinuated that I was supporting the rep/fake industry. If you’re not then say so and we can all get on with our lives. When Rolex and their ADs require you buy a Cellini to be allowed to go onto the waiting list for a steel sports, withhold the warranty card, keep the links after resizing or accept 'gifts' on top of the RRP, you wonder who the real criminals are! I don’t usually edit after someone has replied to a post, which I believe is fair. I take a pride in what I write, for which I won’t apologise. I’ve no idea whether you support the fake industry. You did, as clearly visible above, say that my definition of your phrase “the rep game” was nonsense. I have simply and now repeatedly asked you to define it yourself. In the absence of such a definition from you, who is being obtuse? Last edited by Haywood_Milton; 9th February 2019 at 15:57. Apart from retaining the warranty card (and I’ve yet to see evidence that it’s a Rolex edict rather than just ADs), do you have any evidence to support any of your claims? I don’t recall anyone suggesting that these “super fakes” are of better quality than the originals! Edit: And Haywood has made it clear that any AD who takes the time to know his product can still spot the fakes quite easily. Only my own experience at ADs as build the collection! Last edited by J J Carter; 9th February 2019 at 16:08. It appears WE apprentices have a lot to learn from our elders. Last edited by Metalic Mud; 9th February 2019 at 16:20. 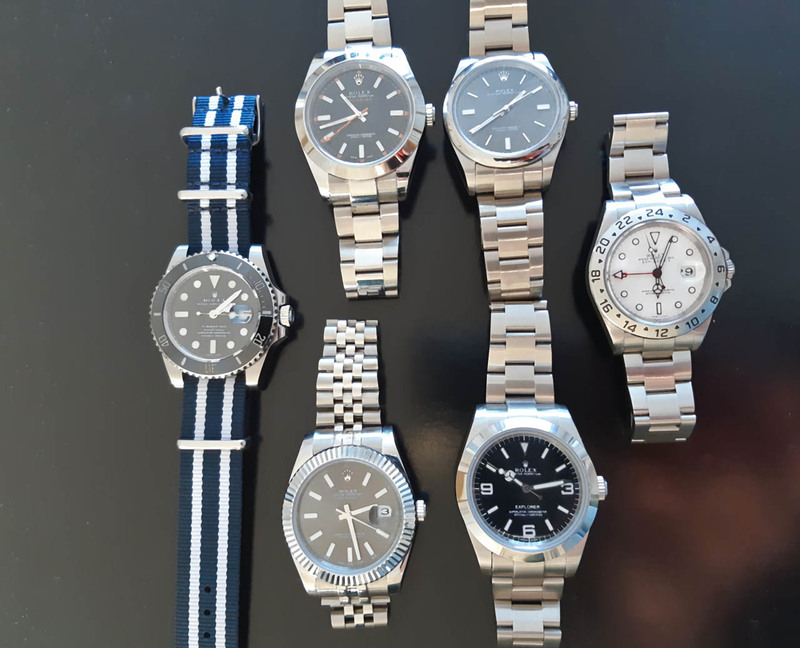 Nice collection but you can buy all but the 16610 and 16570 quite easily at most ADs and the other two have been discontinued for almost ten years! If you’ve had to buy a Cellini to buy any if them, had the links retained (or warranty card for that matter) or had to give the AD “gifts” then I’m afraid you’ve been had! Perhaps you could provide better photos, I first thought the 11610 was a 16610 but, to me, it doesn’t look right. Neither does the explorer TBH. Last edited by Dave+63; 9th February 2019 at 16:23. It appears us apprentices have a lot to learn from our elders. Clearly not your first time as a member here I suspect. Thanks Vanessa I will amend. You edited your post at 14:43 after I replied at 14:38, I made a mistake by not quoting it. My ‘nonsense’ comment was related to my interpretation that you were implying by quoting ‘the rep game’ from my post that I supported it. If I’ve misinterpreted that notion (you still haven’t confirmed what your intent of that comment was) then the ‘nonsense’ statement is null and void. The definition of the rep game is simple (in my non-expert opinion) - anything (or parts thereof) that is not produced by the official manufacturer. People may have stronger views when it comes to things like unapproved straps, glass or servicing but I think we all know what should and shouldn’t be considered genuine/fake/rep/counterfeit. The challenge of course is proving it, which is why I find it so bizarre that you want to shut down debate about it. How is testing and defining an argument - or the euphemisms employee by apologists - shutting down debate? It’s only tedious if one has to post repeatedly to get someone to answer a direct question. My intention was to have you define “the rep game.” It now seems that you don’t believe my definition is nonsense after all. Editing to correct spelling or grammar does not seem significant. Last edited by Haywood_Milton; 9th February 2019 at 16:33. Well you suspect wrong. I have heard of the place. But wasn’t that interested. Anyway. Now that i have a bit more time on my hands, I thought I might give it a go. However, when one of my posts about dealers charging £9000 for a new s/steel Rolex Sub got pulled. I had my doubts as what else might get moderated. Last edited by Metalic Mud; 9th February 2019 at 16:47. However, when one of my posts about dealers charging £9000 for a new s/steel Rolex Sub got pulled. I had my doubts as what else might get modderated. Excessive moderation --- yes, it's the well-known curse of tz-uk. You changed the complete tone of your post, it was not just spelling and grammar. The second sentence was something along the lines of 'I'll ignore your other buzzing' and do you know what, I thought fair enough it was unnecessary and apologised. After I submitted the post with the apology you edited your post which doesn't seem like 'playing fair'. However this is the statement I have an issue with. I have asked you repeatedly whether by posting this you were implying I supported fakes and you have refused to answer. I'll give you another opportunity - yes or no? You're not Haywood and that is not what I asked, as you well know. I will have been editing while you posted, which I wouldn't then have seen. It happens. I don't believe the tone was changed, just expanded. You have variously tried to reinterpret my post or instructed me to post again if I didn't mean something else, rather than asked the binary question above. Now you've asked that, no, that wasn't implied nor did it need to be. Do you support the manufacture, trade or purchase of fakes? You could have left it at 'no, it wasn't implied'. What do you mean by 'nor did it need to be'? To answer your question NO, also I don't have a business which benefits from their existence. HM has made it clear this is a small fraction of his business. This accusation is clearly unnecessary and unwarranted. The forum is richer for his presence, participation, knowledge and wit. I would hate for this kind of drivel to make him less eager to participate and the loss퐋퐨퐬퐬 will be entirely ours. Haywood assesses watches for various parties to determine their authenticity, I assume (and it is an assumption) that he doesn't do it out of the goodness of his heart and therefore derives a benefit from it. It could be financial, reputational or other. Examples of what? His contributions? They are too numerous to count. You have taken a stance, become entrenched and are now getting too defensive. I would suggest you give it a rest, reassess when you are in a clearer frame of mind. If you still feel then that you are justified in your stance, then it is your prerogative to comment as you please. I don't need your suggestions thanks. I have provided straight answers to Haywood's questions, he has not had the courtesy to do the same instead continuing to litter his responses with innuendo. I have not made any 'unwarranted accusations' I have stated what I believe to be fact, if it's not I'll happily be corrected. I typically help police, asset recovery teams, insurers etc pro bono. I typically decline instruction from criminal defence solicitors. if there is any reputational advantage, this would be balanced by the fact that I could earn far more doing other things in the many hours I spend on such work. I simply detest the crooks who would steal from my business, my clients and the wider public, paying no tax and bringing no benefit to society when the rest of us are working hard for our money and paying great amounts of tax. Coming from a reasonably academic background, I also enjoy the battle of wits that comes from catching out the crooked and the complicit. This week a tz-uker called one of my shops to ask if we would assess a five figure Rolex model [that I won't identify for fear of embarrassing him], which I think he had bought privately. My team agreed to do it for him; with my permission they declined a fee but simply asked that he make a donation to the tz-uk fundraiser. If you look through the last couple of years of donations you may see a steady trickle of money from generous tz-ukers in return for such little favours, which as a dealer I consider a reasonable contribution from me in return for the privilege of participating in our host's forum. I'm certainly not perfect. A polite poster asking for help may receive a free link in the post. The free-range rude, as Hannibal Lecter described them, will find I won't even sell them one. Last edited by Haywood_Milton; 9th February 2019 at 23:00. You sometimes don't realise what you have until you loose it and you don't want to loose someone with Haywoods expertise thats for sure (jmo). edit: I have been advised my spelling (loose/lose) is CRAP for which I apologise and will endeavour to do better in the future but I can't guarantee it. Last edited by TheTigerUK; 10th February 2019 at 11:40. What is the rate for 'axe grinding' Haywood? 1. Your own summary of your contribution may not be the most objective. 2. if you require another example, only two weeks ago a member posted about his concerns with an old 93150 Oyster Fliplock bracelet. I suspected that my team could make it good and invited him to send it to us. If I say so myself, we did a great job, perhaps £50-£100 worth at many places, but asked nothing from him (not even our insured postage) except, again, a suggested donation to the forum fundraiser. What value, too, have a thousand pieces of free advice?